Here’s a dirty little secret about safety: People know they should wear helmets when riding bikes, skiing or snowboarding—but many ignore warnings and don’t don helmets. Yet they’re aware of known and suspected consequences of head trauma, especially for older adults. Head injuries are a serious matter and there is growing awareness of this menace that impacts many Americans each year. Our increasing knowledge about sports-related head injuries, especially concussions due to high-impact sports such as football, hockey and boxing, has been covered extensively in the media. The Will Smith movie “Concussion” and the recent death of legendary boxer Muhammad Ali, who suffered from Parkinson’s-like conditions due to repeated head blows, have made this message clearer to more people. On the radio we hear ads for Rehabilitation Hospitals offering recovery assistance for adults who suffer slip-and-fall injuries leading to traumatic brain injury (TBI). One might think this would convince bike riders, especially older riders, to don helmets at all times, but this is not so. Each day I see adults and children wearing helmets when riding—and others who do not. Why? What possible consequences can they suffer? More people ride bikes than engage in winter slope sports, and there are public campaigns designed to encourage (and scare) people into wearing helmets when riding two-wheelers, yet we see many riders without them. 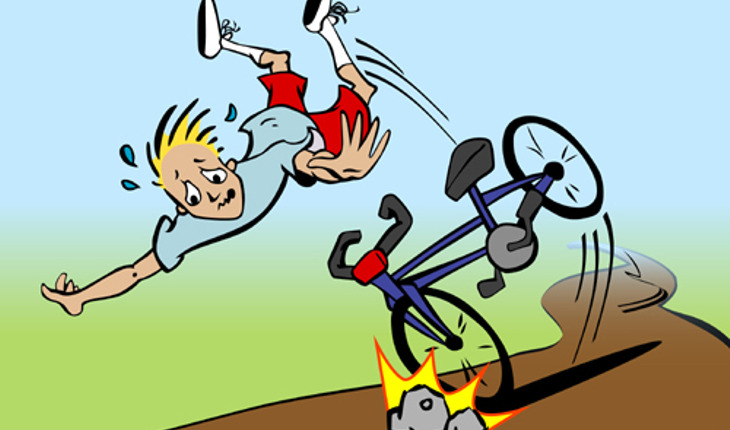 What risks do older adults flirt with if they hit their heads during biking accidents? A neurologist friend of mine discussed in detail how many adults who suffer head injuries are more susceptible to memory and mood problems, especially when there is injury to the temporal lobe and frontal lobe due to sharp impact. Another issue is the severe whiplash that can result from head injuries, but the effectiveness of helmets in buffeting this may be less noticeable. Medical experts are researching the effects of TBI, and according to a Brainline.org article from 2009, “Aging After Brain Injury,” Dr. Steven Flanagan found evidence that “people with TBI are at increased risk of seizures.” Other problems with links to TBI include Parkinson’s, Parkinson’s-like symptoms, and forms of dementia. Some people suffer from balance problems. Chronic and complicated TBI can provoke a variety of physical ailments in people, and they may have to see not only neurologists but also endocrinologists and psychiatrists. A National Institutes of Health (NIH) article “Traumatic Brain Injury in Older Adults” states emphatically that “(TBI) is a significant problem in older adults” and leads to more than 80,000 emergency hospital visits every year. They classify most of these as the result of falls (various types) and motor vehicle crashes. In addition, the healing response to shocks such as TBI is typically “impaired in older adults” because of aging. More studies need to be conducted to determine the effects of aging and TBI, and how best to treat this problem. Head trauma from bike accidents can occur when a rider is struck by a vehicle; when a rider loses control of the breaks and hits a wall, tree or other object; from a damaged road or sidewalk leading to a fall; and various other ways. A helmet won’t prevent a rider from breaking an elbow or wrist, but the effects of those types of injuries are rarely life threatening. A similar situation exists for those who suffer head injuries while skiing, although the speed and angle of incline may have a greater effect on the accident and thus the injury.